(Matthews, North Carolina) August 1st, 2016 - CEM Corporation, a leading global provider of microwave laboratory instrumentation, is pleased to announce the introduction of the new Liberty Lite™ Microwave Peptide Synthesizer. The Liberty Lite is a powerful peptide synthesizer that provides an entry level option for the globally recognized Liberty Blue technology. The Liberty Lite provides advantages over existing peptide synthesizers with its patented use of microwave irradiation during both the deprotection and coupling steps (15 minute cycle times), in-situ temperature control, Flex-AddTM delivery system (eliminates the need for sample loops and allows infinitely variable volume delivery options), and efficient solvent usage. Additionally, the system can be upgraded at any time to a complete Liberty Blue system. Microwave peptide synthesis allows research scientists to make longer, more difficult peptides that were not possible to produce using conventional techniques. It is a faster, highly efficient technique that produces higher purity peptides and allows for the use of more simplified chemistries. 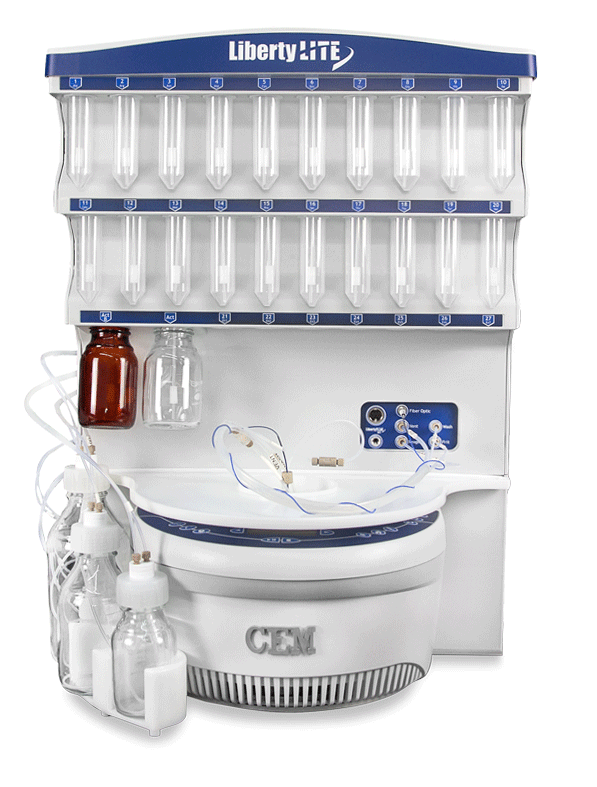 CEM Corporation, a private company based in Matthews, North Carolina, is a leading provider of scientific solutions for critical laboratory applications. The Company has subsidiaries in the United Kingdom, Germany, Italy, France, and Japan, as well as a global network of distributors. CEM designs and manufactures systems for life sciences, analytical laboratories and processing plants worldwide. The Company’s products are used in many industries including pharmaceutical, biotech, chemical and food processing, as well as academic research.